Sally Voss at the library with artefacts ready to be frozen. Two or three times a year CILAMS conducts a programme of freezing to get rid of pests that have taken up residence in our books and small artifacts using a freezer specially bought for the purpose. Freezing is a non-chemical, non-toxic, and effective pest eradication method which is widely used in the international museum community, but high electricity costs here in the Cook Islands makes it an expensive task so only those items that are visibly affected are treated. We alternately freeze our infested objects and then warm them to room temperature - hey presto – no more bugs! It’s a non-chemical method to zap insects without a health hazard. Unfortunately, some of our larger artifacts won’t fit in a household freezer and we don’t have the budget – or the space – for a walk-in freezer but luckily CITC allows us to use some of the space in its commercial walk-in freezers. Recently Mr Trevor Clarke, director of CITC supermarkets, arranged for space to be made available in one of his walk-in freezers, so that some of our large items can be debugged for two weeks. CITC staff helped wrap and transport the items both from our museum and the nearby National Museum. This is the second time CITC has come to our assistance with their freezers and we thank CITC and Mr Clarke for their help in this programme of preservation of our national heritage. CITC staff ready to carry the artefacts into the freezers. The ancient Marquesans were ardent warriors, practiced cannibalism, and emphasised tattooing. The remnants of Marquesan culture which have survived feature stylised designs worked in wood, shell, bone and stone. Bark cloth, turtle shell, feathers and human hair, as well as dolphin and whale teeth, were also used in the manufacture of objects of great aesthetic appeal. Of the five archipelagos of French Polynesia, the art of the Marquesans is unquestionably one that developed to a high level of refinement and originality, making it instantly recognisable anywhere. Marquesan art is characterised by the recurrent theme of the tiki, stylised animal figures and intricately interweaving patterns. 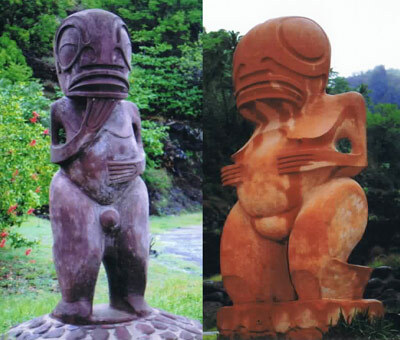 While in the Marquesas we were continually struck by the similarities between Marquesan art and Cook Islands art. 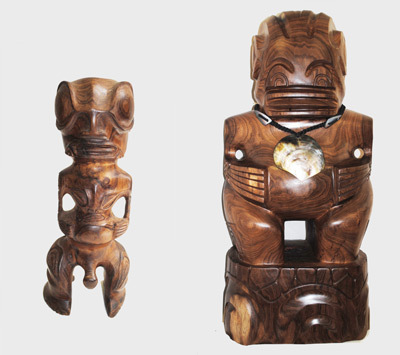 The tiki figure closely resembles the representations of the human form in the Cook Islands – flexed legs, hands held to a rounded stomach, and the large head set low on the shoulders giving the impression of quiet strength. However, the eyes of Marquesan tiki are more rounded, almost circular, and the nose is given broad nostrils. The eyes, in some cases, are enlarged to cover more than half the face and a wide mouth is formed by concentric ovals. Tiki means man or human image but is also the name given to carved images representing gods. Large male tiki were used on me’ae, or outdoor temples, as representations of deified beings. CILAMS has a tiki in its collection (its age and island of origin in the Marquesas is not known). A visiting dignitary from French Polynesia likely gave it as a gift, along with two other Marquesan items which are also in CILAMS’s collection. 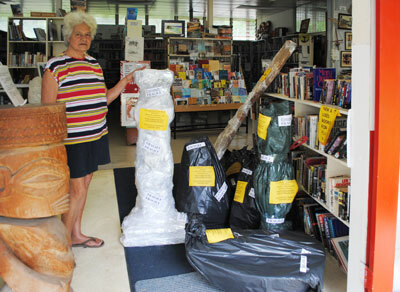 Also pictured (right) is a tiki from Hakahau, Ua Pou, carved by Piri Gilmore (2010). Things have been hectic in Rarotonga recently, firstly with the Pacific Arts Association symposium and then the festschrift for Ron Crocombe. The PAA symposium was held at the Crown Beach Resort and was very much enjoyed by those who attended. The weather was great, particularly for the craft demonstration day when a number of whales cruised along the reef to add to the occasion. See Cook Islands News for stories about the symposium. Many of the visiting museum curators and librarians called in to the library and museum and while somewhat dismayed by the conditions we work under, they had plenty of advice which we’ve already started acting on. The festschrift for the late Ron Crocombe, our former patron and a long-time supporter of CILAMS, was a great success. A festschrift is a volume of learned articles by different authors serving as a tribute, or in this case a memorial, to a respected academic. Papa Ron was much loved as well as respected and a number of distinguished speakers made the journey to Rarotonga to honour his memory. See Cook Islands News for stories about the festschrift. Now that all the excitement is over we should have time to update the blog again.